All snowmobilers owe this man thanks! He changed the way we all ride for the better. 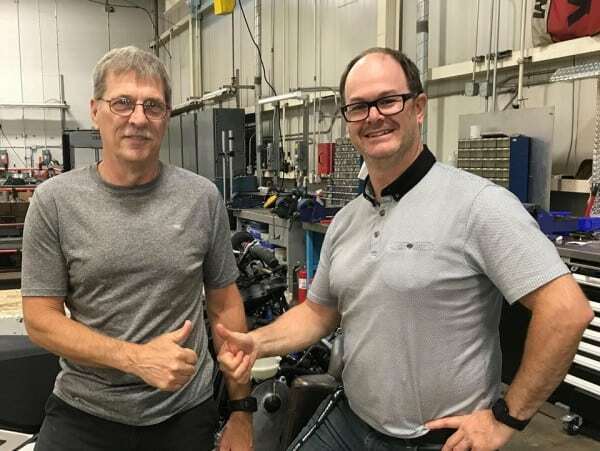 Berthold Fecteau (left) retired from BRP this July with 26 patents in North America between snowmobiles and the Can-Am Spyder. Berthold was one of the originators of the rider forward concept introduced on the very first REV prototypes which he helped design and build. The rider forward concept has since been one of the primary influences behind every other snowmobile designed by all other manufacturers since. Berthold is pictured with Sebastien Thibault, Race and Engine Calibration Manager. Together they have worked together for 16-plus years in BRP racing and engineering sectors. Congrats Bert, enjoy retirement and on behalf of snowmobilers everywhere, thank you!